In March of 2019, the crews at SERVPRO of North Mobile County once again packed up and headed out to help those affected by Mother Nature’s fury. This time, we ventured to Nebraska and Iowa to help residents begin the recovery after catastrophic flooding occurred. A rare confluence of circumstances came together resulting in the epic floods. An extremely cold winter caused a buildup of ice and snow, as well as frozen impermeable ground layers and thick ice covering the waterways. A round of storms and warm weather rapidly melted the snow and ice producing enormous runoff in short periods of time. River ice broke into giant chunks, crashing into and compromising dams, levee systems and packing together to further jam waterways. It was an unbelievable combination of events, with each new one causing further problems. This “bomb cyclone” left behind more than $1.3 million in damages. In addition to roads, dams and other infrastructure it is estimated that more than 2,000 homes and nearly 400 business were damaged. Our prayers go out to all of those affected as they begin to rebuild. We were honored to serve you. As we enter Spring and Summer, vacation season is officially in full swing. Kids are out of school and the weather is prime for creating family memories. We all do our best to make sure our home is safe while we are away. Exterior lighting, security systems and now days even smart phone operated appliances to keep away intruders. For more of us, water damage never crosses our mind. Did you know that a ½ inch supply line flows at a rate of 50 gallons of water per minute? Just for reference, a standard tub holds roughly 80 gallons of water. Imagine your bathtub completely emptying in your home every 2 minutes! Just imaging what damage could be done if this happens on the first day of your vacation and you don’t know until you arrive back home days later. At SERVPRO of North Mobile County, we have seen the damage that can ensue. Not only flooding of the entire footprint of the home, but also mold. If left untreated, a water loss can cause mold growth to begin in as little as 24-48 hours. We recommend that as part of your pre-travel checklist, you add turning off the main water supply to your home. The best way to prevent disaster is to be prepared! One common question we get from customers who suspect a mold issue is what exactly the remediation process will entail. The answer is, quite simply, we don’t know. The process for properly remediating mold can be different in each situation based on a variety of factors. When you call SERVPRO of North Mobile County, we will schedule an inspection with one of our certified project managers. Once on-site, they will evaluate your situation based on all of the unique variables that can affect the remediation plan. Factors that may affect the treatment process include space affected, location within the structure and materials affected. We are IICRC certified and follow all OSHA guidelines to restore the health and safety of your living area or workspace. If you suspect a mold problem in your home or business, contact our offices today at 251-633-7500 to schedule an inspection. If you suspect you may have a mold issue, give us a call to schedule an inspection today! If you have mold growth in your home or office, it may not always be visible. Often, the first telltale sign that you have a mold issue is a musty, damp smell. Mold likes to lurk in hidden spaces or nooks and crannies where it can’t be seen. It is common for leaks to occur behind walls or in concealed spaces. You may not know you have a problem until something smells “off” in your home. When you have a mold issue the first thing you want to do is call in a qualified mold specialist like SERVPRO of North Mobile County to handle the issue. Our certified crews have been specifically trained and received IICRC certification in the proper methods to remediate mold growth and prevent future occurrences. Once the mold issue has been resolved, you may still be left with an unpleasant odor. SERVPRO of North Mobile County also has the training and equipment to rid your home of the last reeking remnants of your mold damage! We can also take care of odors caused by pets, smoke or other contaminants. Contact us today for more information on our odor removal services. Did you know that nearly 50% of businesses never reopen after a business interruption? As part of our menu of comprehensive commercial services, SERVPRO of North Mobile County offers a free emergency planning utility known as the SERVPRO Emergency READY Program® (ERP). This exclusive service offers numerous benefits for our commercial clients in the event of an unforeseen disaster. The ERP can dramatically reduce downtime and costs associated with a water or fire loss. How does it work? Sales representatives provide free consultations to our clients and compile pertinent information into an easily accessible app for Apple and Android devices. The app includes detailed information on shut offs, photos, relevant contacts and even insurance information. At SERVPRO of North Mobile County, we are ready for whatever happens and we developed our Emergency Ready Plan (ERP) to help make sure you are ready as well! If you would like to prepare your business before disaster strikes, call SERVPRO of Northwest Mobile and ask to speak to your local sales representative. When it comes to commercial services, we don’t just take care of fire and water either. At SERVPRO of North Mobile County, we offer a wide range of commercial services including mold remediation, biohazard cleanup and specialized cleaning. From standard carpet and tile cleaning to post-construction and customized cleaning packages, we offer services to fit a variety of needs. No job is too big or too tough for us to handle! When you experience water damage in your home, it is important that you call in a qualified, professional mitigation company to properly handle the damage. Although it may look like something that you can easily handle yourself, there are hidden damages that can show up over time and have far reaching consequences. A little hidden moisture underneath flooring or behind the walls can easily create a domino effect of damage, such as buckling floors or even mold. It is important to also note that your insurance company may not cover those ensuing consequences if the water damage wasn’t properly mitigated by a qualified and licensed restoration company. At SERVPRO of North Mobile County, all of our team members have undergone extensive training and are IICRC certified in the all areas of water damage mitigation. In addition to IICRC training, we participate in continued education on both the regional and national level as part of the SERVPRO franchise network. We are always up to date on the latest techniques and technologies to make water damage “Like it never even happened.” We will also work directly with your insurance company to alleviate that burden and stress for you. 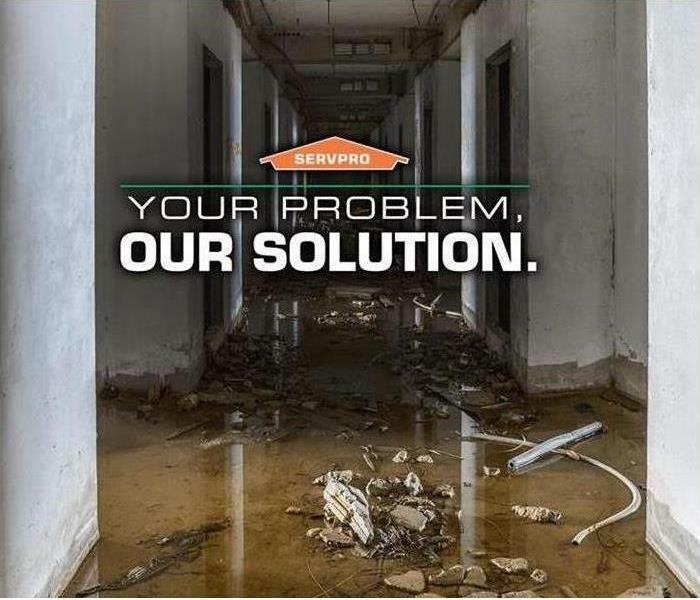 If you experience water damage, call the experts at SERVPRO of North Mobile at 251-633-7500. Water damage in your home can cause unnecessary stress and expense. Nobody wants to have to deal with a water loss, but sometimes its unavoidable. At SERVPRO of North Mobile County, we are always Here to Help® should the unexpected ever strike your home, but we want to help you minimize the risks of that happening. The first step is understanding what the most common causes of a water loss in a residential structure. If you are going on trips it is always a good idea to turn off the water to prevent major damage should anything occur while you are away. If you do experience water damage in your home call SERVPRO of North Mobile County right away to minimize the damage. Although it could be 80 degrees on Christmas Day here in the South, that doesn’t mean we can forego cold weather preparation. Sure, you may think you will never need to know how to prevent frozen pipes, but weather can turn on a dime. In Mobile, it can change seasons between breakfast and lunch so, it is always better to be safe than sorry! At SERVPRO of North Mobile County, we know that the best protection is to prepare for the unexpected. Preventing frozen pipes is easy to do and it could save you massive damage and outrageous expenses. Did you know that each year in the U. S., a quarter of a million people will have at least one or more rooms in their home affected by water due to frozen pipes? According to the Institute for Business and Home Safety, claims payments for those types of losses have totaled more than $4 billion collectively! Freezing pipes caused by cold weather is much easier to prepare for than other weather threats such as hurricanes, tornadoes, and flooding. Taking just a few simple steps can virtually guarantee that you won’t have water damage caused by frozen pipes. CLICK HERE to be taken to the Red Cross’ website for more information.